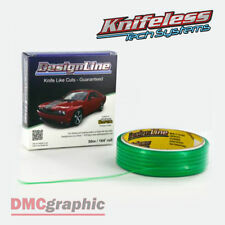 DESIGNLINE KNIFELESS TAPE. Knifeless Design Line Tape has been specifically designed to operate with the stretchable adhesive films which are laid over contoured shapes with curved edges to allow the tape turn easily to both directions. If you see any creases from unrolling the roll, this WOULD NOT affect the item when you apply to your car! Decals & Stickers. Car Shift Knob & Boots. Gloss and smooth finish. Bike & Motorcycle Parts. Type: 500cm car traceless cutting film tape. 1 500cm car traceless cutting film tape. This can be for any of the following reasons -. Net weight: 10g. Color: Green. Steel Brushed Aluminium Vinyl. 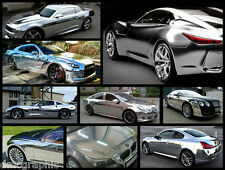 High quality steel Silver Brushed Aluminium Vinyl film has been designed for vehicle wrapping with air release chanels. You can be sure that this films are non-damaging and non-permanent. 1 x Free squeegee. Can be used to mask small scratches and imperfections. Its also water resistant and UV stable, so applying it to exterior parts of the car is not an issue. Black gloss vinyl. Black gloss premium quality vinyl. 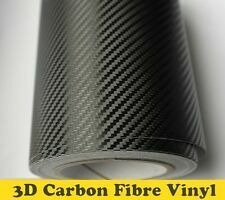 3D Textured carbon fibre vinyl, it's a quality vinyl that reflect lights similar way real carbon fibre parts do. That gives great realistic effect. 3D BLUE carbon fibre vinyl. Fantastic realistic blue, lightly embossed carbon fibre vinyl. 1 x Free squeegee. Can be used to mask small scratches and imperfections. Satin black matte vinyl. Its also water resistant and UV stable, so applying it to exterior parts of the car is not an issue. 5D Carbon Fibre Vinyl. Cream Leather Texture Adhesive Vinyl Film. 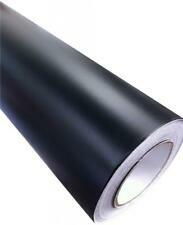 This is the latest Leather Pattern Adhesive Vinyl Film in the market. It has been designed to enhance and imitate the real look of the leather. 3M Original MX12 Matrix Black Vinyl Wrap. The 1080 Series Full Coverage Film is a durable, double-cast vinyl film designed to cover entire vehicles or their components. Available in rolls of 1.52 m width, which allows for wrapping without joining almost any part of the vehicle. Car Vinyl Wrapping Tools Item Specification: Product Type: Car Wrapping Tool Kits for Solar Film Material: Plastic/Rubber/Stainless Steel Car Compatibility: Universal Compatibility: Suitable for application of all types of window tint film, paint protection film, decals,solar film,wrap film Item Feature: Durable squeegee made from high quality stainless steel/rubber/plastic Scrape off the bubbles downright under the film, prevent glass car body and film Scratch-less, no marring or marks, just smooth motions that easily glides across vinyl films and painted surfaces Lightweight makes it easy to use and store in smaller spaces Convenient to use including: 1 x Rubber squeegee with Handle 1 x Black conqueror squeegee 1 x 4" blue squeegee with Fabric Felt 1 x Pink scraper. Cool Fashion. Car Shift Knob & Boots. The ultimate in flexibility. Self adhesive. Bike & Motorcycle Parts. Very easily cut - scissors will slide right through. Bubble Free Air Free, 1, Perfect Heat radiation 2: easier to stick (without bubble point). • APPLICATION: Stretchable with Air Chanels, Bubble Free. Special Texture Vinyl. This material can be used on the interior or exterior of your vehicle. It can cover any smooth surface. It will wrap dash parts, mirrors, trim, or the whole exterior of the vehicle. 8 stickers BBS 4 x 1,3 cm. 8 stickers BBS 4 x 1,3. High quality die-cut vinyl sticker suitable for both indoor and outdoor use. High resistance to water and sunlight. Vinyl cut sticker suitable for placing high quality both indoors and outdoors. Carbon Fibre Vinyl. This highest quality adhesive stretchable Alcantara look vinyl film has been designed forvehicle wrapping. Special Texture Vinyl. Alcantara Adhesive Vinyl. ALCANTARA LOOK ADHESIVE VINYL. 5D Carbon Fibre Vinyl. Brown Leather Texture Adhesive Vinyl Film. 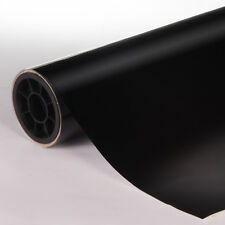 This is the latest Leather Pattern Adhesive Vinyl Film in the market. It has been designed to enhance and imitate the real look of the leather. Special Texture Vinyl. This material can be used on the interior or exterior of your vehicle. It can cover any smooth surface. It will wrap dash parts, mirrors, trim, or the whole exterior of the vehicle. WOODLAND matte camouflage vinyl. R ealistic woodland camouflage vinyl. Size: 1.5m x 2m. 1 x Free squeegee. Can be used to mask small scratches and imperfections. Its also water resistant and UV stable, so applying it to exterior parts of the car is not an issue. NUMBER OF RACE STICKER BOMB height 12 cm. We specialize in producing modern and historic adhesives, race car replicas, total wrapping. Colore Multicolore. High quality printing on adhesive PVC. Iridescent Holographic Vinyl. Perforated Fly Eye Film. 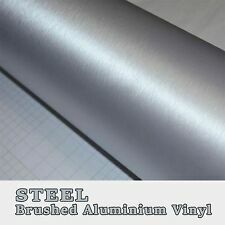 Aluminium Steel Brush Vinyl. Carbon Fibre Vinyl. This material can be used on the interior or exterior of your vehicle. It can cover any smooth surface. 1 Tommy Hilfiger sticker of 10 x 6,8 cm. 2 Tommy Hilfiger stickers, 4 x 2,7 cm. 1 sticker Tommy Hilfiger 10 x 6,8. 2 stickers Tommy Hilfiger 4 x 2,7. High quality printed vinyl sticker suitable for both indoor and outdoor use. Large main pocket and smaller front pocket comfortable access to parts or tools. 1 Piece Car Wrap Tool Bag. - Water spatula or large sleeve tool. - Can be hung on your life, comfortable to take the necessary tools when working. 5D Carbon Fibre Vinyl. Brushed Steel Aluminium Vinyl. This high quality real lookSilver Steel Brushed Aluminium Vinyl film has been designed for vehicle wrapping with. SILVER STEEL BRUSHED ALUMINIUM VINYL. 2 stickers Ducati Corse ref.2 of 5,6 x 6 cm. 2 stickers Ducati Corse ref.2 5,6. High quality printed vinyl sticker suitable for both indoor and outdoor use. High resistance to water and sunlight. Manufacturer's warranty for 5 years. 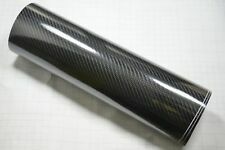 3D Textured carbon fibre vinyl, it's a quality vinyl that reflect lights similar way real carbon fibre parts do. That gives great realistic effect. 3D black matt carbon fibre vinyl. 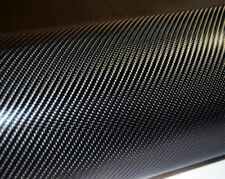 Fantastic realistic black matte lightly embossed carbon fibre vinyl. Sticker vinyl car with possibility to choose your size and color. If you see any creases from unrolling the roll, this WOULD NOT affect the item when you apply to your car! Car Shift Knob & Boots. Bike & Motorcycle Parts. Invisible Air-Release Channel, easily get rid of bubbles during installation. 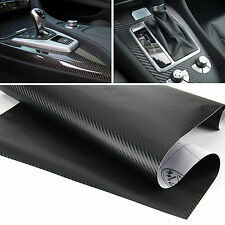 Automotive Vinyl Wrap BLACK 1520x300mm Velvet "Fur" Suede Fabric. This vinyl is suitable for interior use and will adhere to almost any well-prepared surface. You can lift to re-fit and can be removed years later to reveal the surface beneath exactly as it was covered. If you see any creases from unrolling the roll, this WOULD NOT affect the item when you apply to your car! Size: 135 x 20cm. Car Shift Knob & Boots. Decals & Stickers. Bike & Motorcycle Parts. Car Exterior. This film sticker is well made of premium material for car headlights, fog lights, taillight, etc. 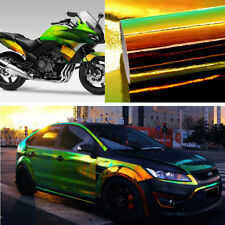 - You can use this vinyl film for any headlights, fog lights, side-marker lights or even top part of the windshield, etc. If you see any creases from unrolling the roll, this WOULD NOT affect the item when you apply to your car! Then the crease will be flatten. Decals & Stickers. Car Shift Knob & Boots. Bike & Motorcycle Parts. If you see any creases from unrolling the roll, this WOULD NOT affect the item when you apply to your car! Digital Camouflage car vinyl wrap. Can be used to mask small scratches and imperfections. Size:1.5m x 2 m 1 x felt edge squeegee. Can be used to mask small scratches and imperfections. Its also water resistant and UV stable, so applying it to exterior parts of the car is not an issue. Grey gloss premium quality vinyl. If you see any creases from unrolling the roll, this WOULD NOT affect the item when you apply to your car! Forest camouflage camouflage vinyl. Camouflage Car Sticker, Green. Can be used to mask small scratches and imperfections. (If you see any creases from unrolling the roll, this WOULD NOT affect the item when you apply to your car! Decals & Stickers. Battery & Converter. Car Shift Knob & Boots. Bike & Motorcycle Parts. 1) About the crease. Our 2 stripe viper kit is made up of 2 thick stripes each 200mm wide with 2 pin-lines 20mm thick either side. The kit includes enough stripes to cover the just the bonnet. Our Stripes are available in other lengths so you can buy the length you need. Protect your doorsills--and you car's resale value--with this Doorsill Guards. Easy to apply and remove from any type of surface finish. This protection film remains invisible and will help you preserve the condition of the paintwork around your door handles,door sill and edges by helping prevent scratches, which are unsightly and can reduce the resale value of your car. Brushed aluminium vinyl is lightly embossed and have realistic feel and look of real brushed aluminium. Can be used to mask small scratches and imperfections. Its also water resistant and UV stable, so applying it to exterior parts of the car is not an issue. Size:3m x 75cm. Can be used to mask small scratches and imperfections. Its also water resistant and UV stable, so applying it to exterior parts of the car is not an issue. 1 x Free squeegee. White matt vinyl.